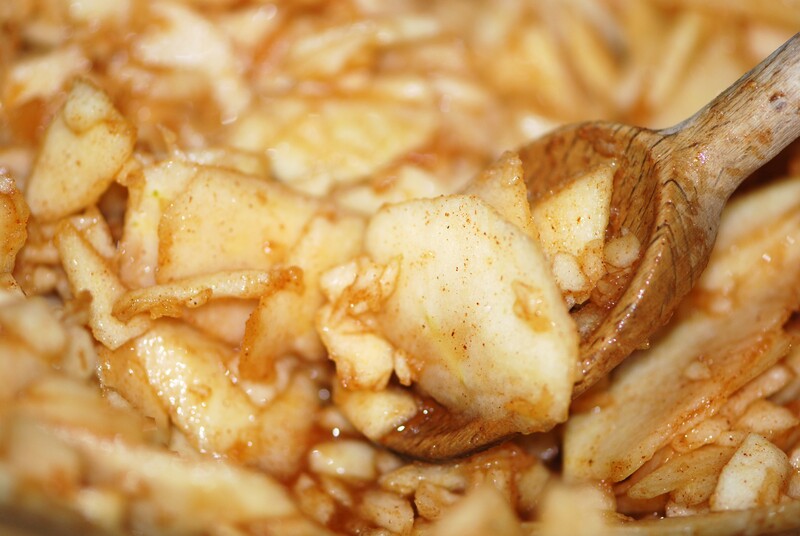 The following is an easy and very delicious apple pie recipe. The nutty crumb crust is mixed by hand and is patted into the pie plate. Sometimes I don’t feel like rolling out a pie crust, so that’s another reason why I like this recipe. If you don’t want all the b.s. just scroll to the bottom, the recipe is repeated without the pictures and step-by-step. I’m going to break this recipe down into two parts. First we’ll talk about the crust, and then we’ll talk about the pie. 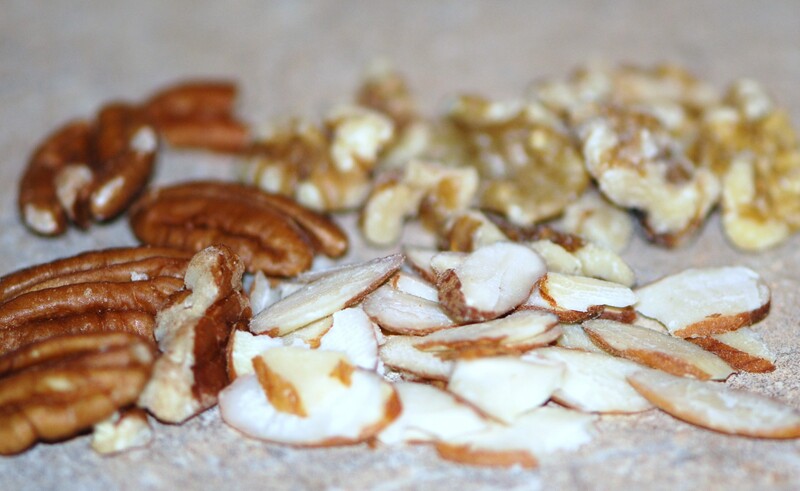 When a recipe calls for nuts I like to mix a couple of different kinds. So, let’s say you’re making a nut roll and it calls for walnuts, I’ll add some pecans too. This original nutty crumb crust recipe suggested using almonds, but I used a combination of ground almonds, walnuts and pecans to get my one cup measurement. 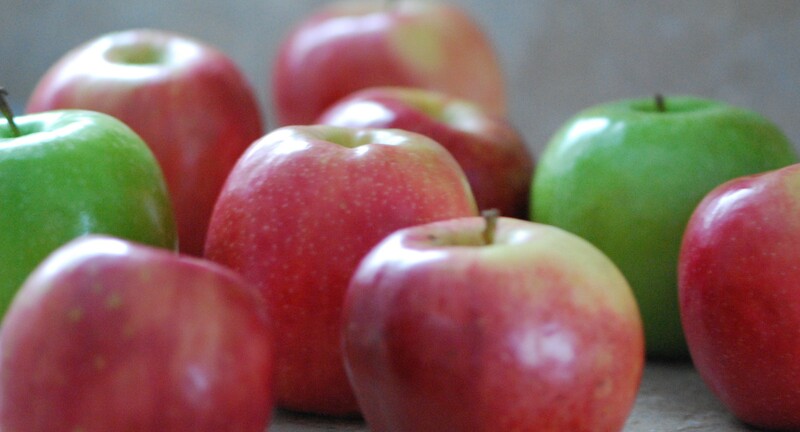 I also use a combination of apples, depending on the season and what’s available for example Macintosh, Rome, Cortland, etc. 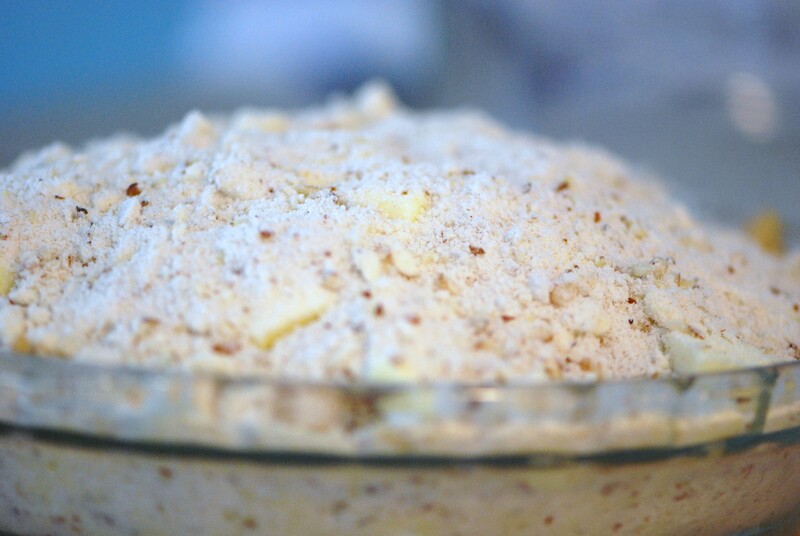 Whisk together the flour, nuts and sugar in a large bowl. Cut the butter into small pieces and with a pastry blender “cut in” the butter into the flour mixture. 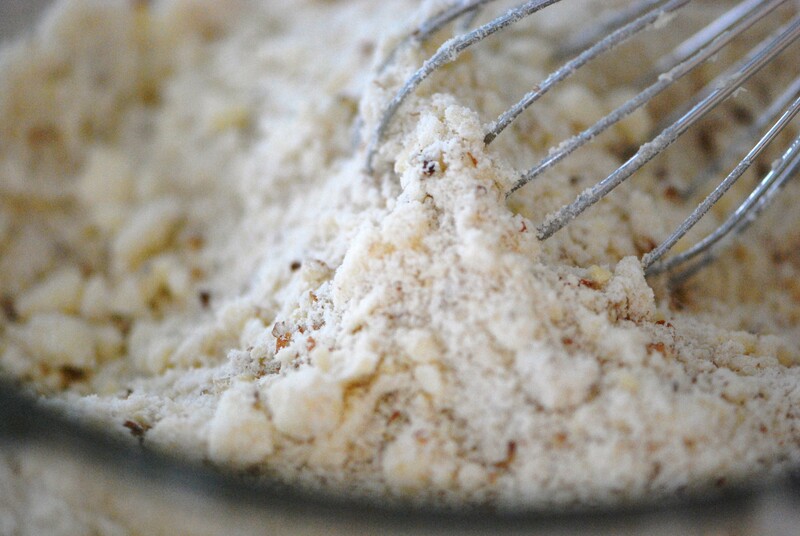 Use your hands to finish making a crumbly mixture. 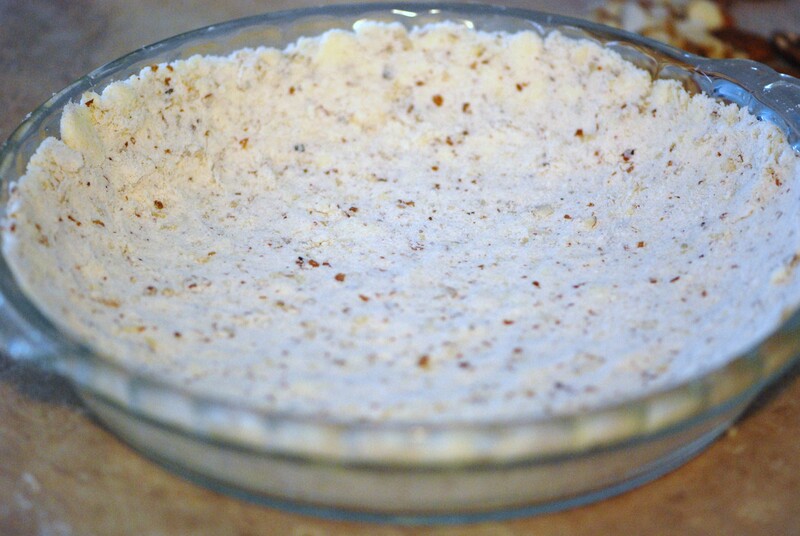 Using about ¾ of the crust mixture firmly press into the bottom and up the sides of a 9” or 10” glass pie plate. I’ve even used a 10” glass tart pan. Set the remaining crumb mixture aside for the top of the pie. Peel and core your apples. I use a food processor to cut into ¼ inch thick slices. Mix together your apples, lemon juice, sugar, cinnamon and salt. Pour the apple mixture into the pie shell. Cut your butter into small pieces. Dot the apple pie with the butter. 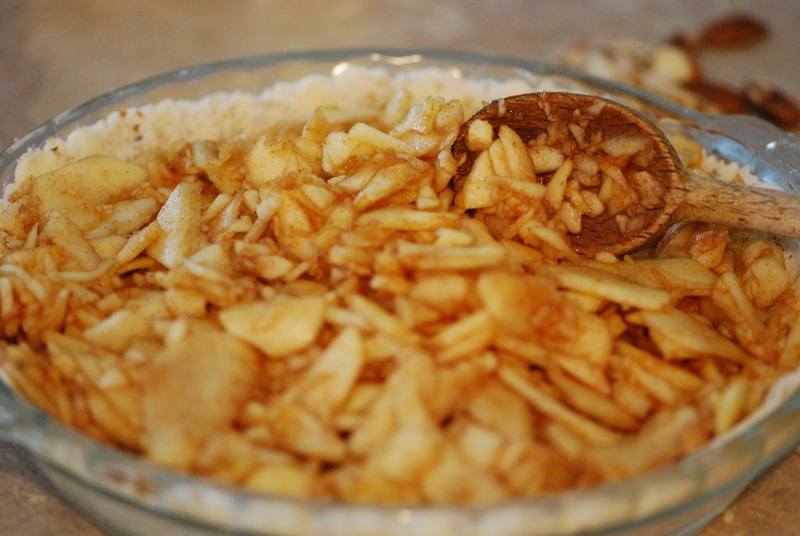 Cover the apples and butter with the remaining pie crust crumb mixture that was set aside. Bake approximately 1 hour, or until the crust turns golden brown. Remove from the oven and cool on a wire rack. 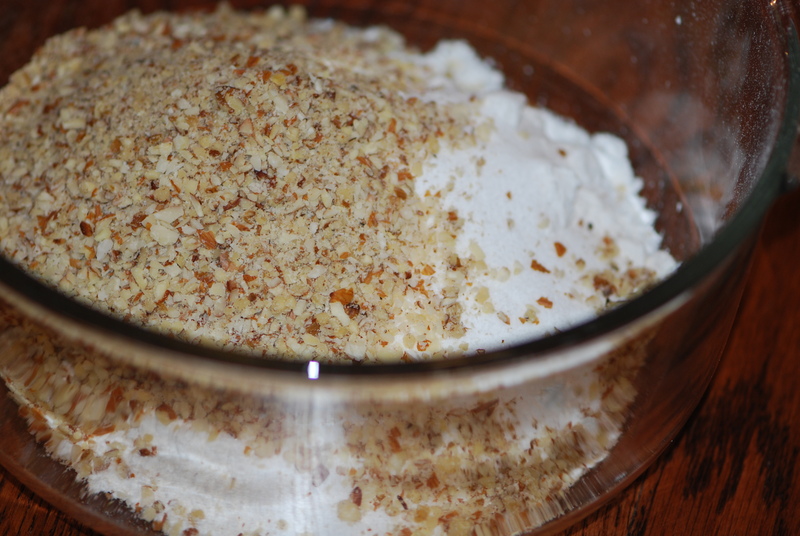 Whisk together the flour, nuts and sugar in a large bowl. Cut the butter into small pieces and with a pastry blender “cut in” the butter into the flour mixture. Use your hands to finish mixing together. Mix together your apples, lemon juice, sugar, cinnamon and salt. Pour the apple mixture into the pie shell. This pie is great with whipped cream or ice cream.